American Joey Chestnut, left, looks to defeat former champ Kobayashi for the third straight year tomorrow. 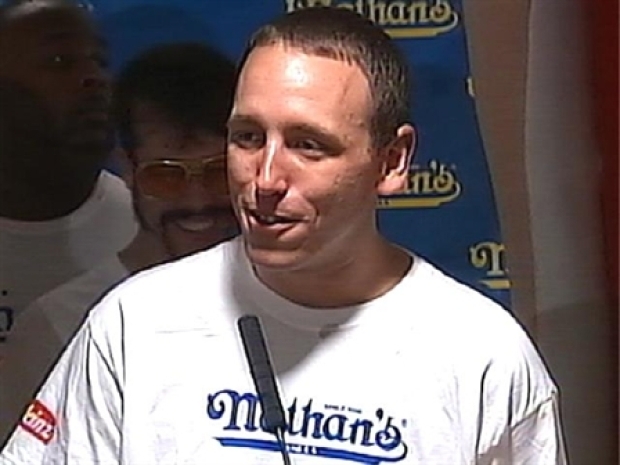 Coney kings hot-dogged it for the cameras yesterday, mustering tough-guy poses and stare downs at the weigh-in for Saturday's traditional July 4th hot-dog eating contest. American Joey Chestnut has won the last two events, supplanting previous six-time champ and Japanese legend Takeru Kobayashi, cooking up a rivalry not unlike that of Nadal-Federer. The weigh-in was more photo op than anything else; it's hard to imagine one of tomorrow's 20 contestants being too light or too heavy to try to wolf down 60-some dogs in 12 minutes. Chestnut's two wins have both been dramatic. His 66-dog total in 2007 was a record for the 93-year event, and last year, he beat Kobayashi in the first-ever overtime eatoff. The winners of the last four Nathan's Famous Hot Dog Eating Contests appear ready to renew their rivalry in Coney Island tomorrow. "I've been training pretty hard the last six weeks getting ready for this contest," Chestnut said. "I feel good." Chestnut, the hulking Californian, checked in at 218 pounds yesterday, while Kobayashi, hardly an imposing figure, is a dainty 132 pounds. Kobayashi often brings a trick or two to Coney Island. One year it was yellow hair, another it was ripped abs under a T-shirt he was more than happy to lift for at least a dozen photographers. "I'm going to be able to battle well this year," he said through an interpreter. Maybe it was the head-start, or maybe it's just because they can eat eight at a time. Either way, the elephants beat the humans in a tune-up for tomorrow's hot-dog eating contest in Coney Island. Even Mayor Bloomberg got involved in yesterday's spectacle. He called the competitive eaters "the most dedicated athletes in the world," according to The New York Daily News. "July 4 isn't a holiday for these men," the mayor told the paper. "It's going to be a day of reckoning."